A small fictitious southern rural branch terminus at the end of a single track line, in the days of BR steam. A private factory siding with a wagon being delivered or collected complicates the shunting. The layout is DCC using the MERG booster, points and signals are controlled using R/C servos. Dingham couplings with uncoupling magnets are used for automatic operation. MERG CBUS modules running an early version of OpenLCB/NMRAnet drive the point and signal servos, count wagons and check loco positions. An interface to XpressNet allows the layout to be run either under operator control or with a computer doing all the shunting. In order to have a reasonable 0 gauge layout in a small space everything has to be squashed down, the curves are 5ft radius. The point work was draw in Templot and then made from C&L parts. Trees are from florists wire, postiche and scatter. Buildings are draw in TurboCAD and then laser cut from MDF. 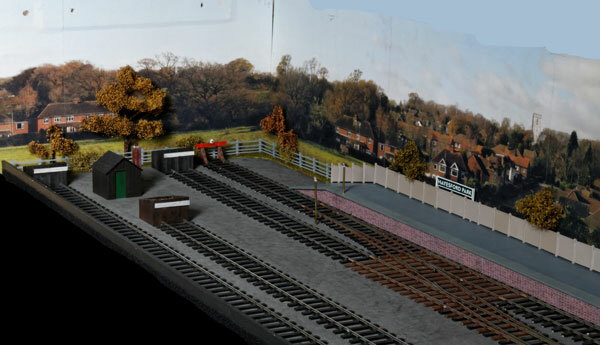 As of 1st March 2013, the layout still needs a lot of work. The station still needs a building, fencing, working signals, and all the track needs ballasting. Then all the detail work can begin. August 2013: Laser cut station building. May 2013: Some progress on the end board.